While Monster Hunter 4 still represents a distant dream for many of us, its Japanese release on 14th September creeps ever closer. As a result Capcom is dishing up regular snippets of information for the Japanese market, while those of us elsewhere can look on as interested parties that can only hope. As translated by Siliconera, more details and screens have been unleashed for Chico Village; the previously seen location resembles a Caribbean island that's populated by the cat-like Felyne creatures. In terms of its purpose and functionality, it seems like an expanded variation of the farm and Argosy Captain that some may know from Monster Hunter 3. There'll be various services available, including special armour and equipment for Felynes that gives them stronger odds when tackling monsters, and like the masks in Tri will influence traits on the creatures' attack habits. Just off the coast of Chico Village is PocaPoca Island, where a large number of Felynes will gather. One option in this area is to send the creatures on quests to retrieve crucial resources for Felyne armour; the greater the distance the higher the risk, and you have to equip the party — of up to five — with food for the journey, as well as take account of their characteristics and skills. There's also a fishing machine that needs certain goods and willing Felynes to operate, with the goal of positioning over a well-populated area of water and getting the timing right. You can see some images below. Capcom has said nothing officially about this title coming to the West, but we imagine that Nintendo may also take an interest in bringing this 3DS exclusive to other territories, having previously stated that it'll support publishers with localisation. We'll have to wait and see. I really hope that this gets localized. I don't care when just a confirmation is good enough for me. @Relylp Yup. I think it's safe to expect it after MH3U's success. I'll still definitely buy MH4 it on 3DS if it gets localized, but I'd much rather have a main console version for online play so hopefully there's a WII U/PS4/Xbox One version in the works at some point. @ToxieDogg Apparently, Monster Hunter won't go on those systems because I heard that Nintendo has a contract with Capcom. I'm definitely looking forward to this if it gets localized. I hope there will be a double Savage Deviljho quest to try. It seems since the infamous "Region locking is a non-issue" article went up, not a single day goes by without a bit of news to completely delegitimize it. This is my most wanted game for next year (maybe if we get it ill be by that time ) and bravely default. Looks amazing! I've been playing a ton of MH3U on WiiU and 3DS lately. I want this to hit USA ASAP! Please release Mh4 here as soon as possible on both 3ds and Wii U Capcom and Nintendo get on this. @ToxieDogg MH4 has online, just so you know. Lets hope they don't treat online on 3ds the way they did MH3U. Just dumb! @ricklongo Not sure about that, it'd be tricky to pick the right armour and weapons for each fight without understanding the text. @ThomasBW84 True, true, but the point still stands for the discrepancies between the Americas and Europe. It's kind of a bummer, I really wanted to get Mario & Luigi before Pikmin hits. Seriously they should have it for wii u. Hoping Chameleos returns as well. Just got into Monster Hunter with Freedom Unite on PSP. I have to say, this is one of the few games I am legitimately excited for now. 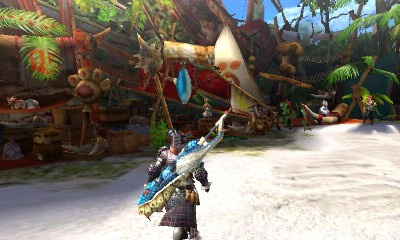 Monster Hunter 3 Ultimate online has been some of the best multiplayer gaming I've had in a long while. Capcom has been very good lately, please bring this game to everyone! I plan to purchase Monster Hunter 3 Ultimate for my Wii U next weekend, so that will be great till this comes out next year. @RudyDog you should play Monster Hunter Tri on Wii, or Monster Hunter 3 Ultimate for 3DS/Wii U (would suggest 3DS/ Wii U version as Wii version as less and the servers are now down). Makes the PSP game look like crap, and that's a VERY hard thing to do! 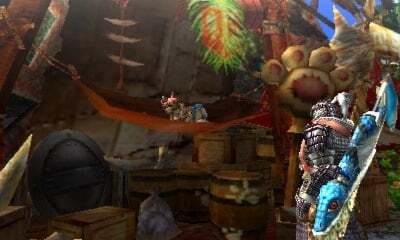 I hope MH4 fixes some of the issues that have existed in the series such as the absurd multi layered room setup online, allowing the change of equipment without a loading screen, an actual explanation of stats without wearing the stat to know what it does, helping new players, and being able to BIND OUR OWN BUTTONS!. Its somewhat odd that this is the first monster hunt of a new generation and its coming out on portable consoles first.Someone start a petition ! I'm hoping we get Monster Hunter 4+ instead of the first release, since if there is an updated rerelease the chances of it being release stateside is slim. WiiU!!!!!!!!!! Still loving Ultimate one of the best games. I can't even imagine monster hunter on a portable system. I mean that in the most negative way possible. Once I would love to play Ultimate on a drive in theater screen outside. How friggin sweet would that be. I am about 460 hours into the Wii U version of Ultimate. Please bring this to the US. ^^^Close to 600 hours almost or about two months in since I got it. I know where your going with that, but sadly its true. Monster Hunter is one of the few games that doesn't opt to explain every little detail in-game, not quite old-school but it gives you what you need and lets trial and error do the rest. Not surprising but I'm really excited for MH4. Not just because of the new features either, a lot of the classic monsters are making a return too. @Zombie_Barioth Yeah, I want to hunt the classic monsters but with the smoother controls of 3 Ultimate. @Skyfox2000 It might arrive on Wii U. In Japan, 3 Ultimate came out on Wii U after the "3DS-exclusive" and when Nintendo localised it, all they had to do was bring both so I wouldn't worry. Sounds like a nice change of pace from the main game. So conflicting... the 3DS version seems to work with online by itself... but a WiiU version would be awesome noentheless! @ollietaro They better have water battles! It'd be a shame if they didn't include them! If they axe them, I blame all the whiny "hunters" that couldn't hang under water. @NMH-TRI Nope. No underwater combat, but I don't think it's so much that Capcom "axed" it, moreso that aquatic battles were Tri's thing. Climbing and Monster-mounting are 4's schtick. I see no harm in taking a break from swimming for a generation, though I do admit that underwater combat outside of the Flooded Forest certainly is fun, in its own right.